< Previous Post Previous post: Awesome Chaotix is Awesome! Classic sonic and classic robotnik with classic badniks is bonuses for me. I wonder…is the 20th anniversary sonic game going to be sonic Running thoughout the years, so u play classic sonic in 3D in old zones and then work your way up to sonic adventure 2 etc? and then you play todays sonic? Sonic Generations is the 20th anniversary game, and each zone will have a 2D level where you play as Classic Sonic, and a 3D level where you play as Modern Sonic. So there’s a city level from Sonic Adventure 2, and the 3D one will be like the original, and there will be a 2D level in the same area with similar mechanics, like the truck chase finale. Green Hill Zone will have a classic 2D scrolling level, while a new level is made for Modern Sonic. there, classic sonic figures from jazwares! And yet, the UK STILL doesn’t have Knuckles or Shadow on the shelves! Bloody hell! I want those so much…. and you know Tomy is never going to distribute these… we’re still waiting for a mass distribution on the ASR figures for gods sake! And Super Shadow and Super Silver too! Bean, Bark and Fang…That’s all I want! Yes, yes, that new Zelda figure looks cool. I miss that stout little hedgehog. FFFFFFFFFFFFFFFFFFFFFFF- now I have to buy all these. This is bitter-sweet news, emphasis on the SWEET! This is awesome, but quickly, someone tell Jazwares, we don’t want Shadow in a comic book pack. He’s going to be packed with either Rouge or Omega, Why not pack Rouge and Omega together, we don’t need the same Shadow figure again! The EggRobos make me so happy I can poop my pants. And the ten inch classic Sonic looks amazing. Now I don’t have to be sad about never getting the First4Figures large classic Sonic. Last Picture, far right, is that the Tornado 1? Does anyone have a better guess? Wow! Those are all so awesome, especially the big classic Sonic figure. So much for saving my money. 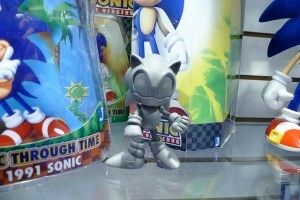 And is it just me, or does the modern Sonic figure, next to the big classic one, look fuzzy? I love that freaking figure!!! I’m so gonna get it. WHOA! Have they improved the joints design or -what-! I wish my Arthur!Sonic figure had those instead of his nobbly knees! …then again, I wuv him anyway<3 Because those nobbly knees are awkwardly charming. Like my Squall Leonhart's flimsy arm, it's the 'defects' that make them unique. You can't miss him when SEGA re-release his games every year-and-a-half, people make fanart and fangames of him, he's still plastered all over merchandise and ranters still repeat that sentence over and over like it's never been said before. No, trust me. You can't. …At least not her actual design! I have an Sonic-y one they could use…? Is anyone else slightly peeved by the fact that it’s taken almost twenty years for Sonic to get a genuinely decent, ongoing line of figures? Seriously, I’d have killed for this sort of stuff as a kid, but they never even made any ‘proper’ Sonic action figures until the ReSaurus Sonic Adventure ones. They look awesome, I hope they come out in the UK. I would probably get all of the figures, but only the Amy and Shadow Plush seeing as I already have Tails, Knuckles, and Sonic plush. ‘Cause it honestly made more sense, considering the character designs, to make plush dolls? Classic Robotnik galore? More Eggman action figures? Someone’s been reading my posts. Now my money will be flying out of the window. I am so in your boat! I’ve been dying for a classic Sonic figure for 20 years here. I remember in 1991, I would search Toys R Us for a Sonic figure that didn’t exist. In 1994, I got the McDonalds Sonic toy and took it with me everywhere. In 1995 I got that motorcycling Sonic toy which I lost within days. Finally in 1999 I got the Resaurus Sonic and it has been my favorite toy for over 10 years now. But he’s not classic Sonic and I’m thinking that a good classic Sonic figure is the one thing that can dethrone my Resaurus hero. Yeah I agree, I used to play with the freeking mcdonalds ones all the time. um may i tell you something? i know this is pretty good (im going this year 8D) but havent you forget something like billy hatcher and samba de amigo, do you even feel that they also left behind :C it’s kinda sad to see them not to erm.. appear .3. i dont mind sonic but i thinks he’s popluar already XD shouldnt you give billy hatcher, amigo or other give chance to be proud once again this year? pretty pleaasey? I NEED that classic sonic plush. Like…I NEED IT. Not just want, NEED. Oh god its perfect. Absolutely perfect. I’ve been looking for years for a plush like that. Almost every sonic plush I’ve come across has been horrible…until NOW! If anyone knows anything about it please, PLEASE tell me.